Here it is, before I sign off for the night, a crazy wacky screenshot I took last night from my weather report. Just before the third place play-off match yesterday, a terrifying thunderstorm hit Brussels, and most of northern Belgium. It started with a few drops, then a massive downpour chucking bucket loads of water into the city causing flash floods. The following gale force winds knocked trees over and caused general havoc. All this following days 30°C+ heatwaves going through Europe. What was really weird is that there were golf ball-sized hail falling from the sky. 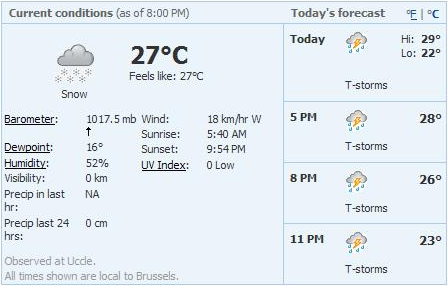 Of course, my weather report reports that it is snowing in 27°C... Are you serious? I'm sure that is scientifically impossible!